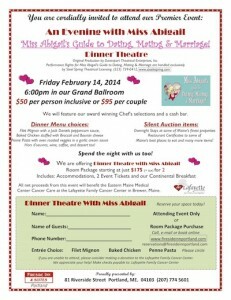 an Evening with Miss Abigail – a Dinner Theatre production of “Miss Abigail’s Guide to Dating, Mating & Marriage!” All net proceeds benefit the Lafayette Family Foundation. For More information, please download the flyer. 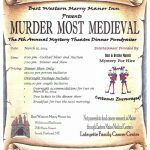 The BEST WESTERN Merry Manor Inn will host a Medieval Murder Mystery Dinner and Silent Auction on Saturday, March 15, 2014. Mystery for Hire will perform a “Murder Most Medieval” All net proceeds benefit the Lafayette Family Foundation. Download the Murder Most Medieval Flyer Here.